Vintage Golf Attire in Mid-Swing. This Gorgeous Cribbage board is Laser Engraved on a Solid American Maple Continuous Cribbage Board for 2 Players. Comes with Instructions and Wood Cribbage Pegs cleverly concealed in a Secret Sliding compartment. 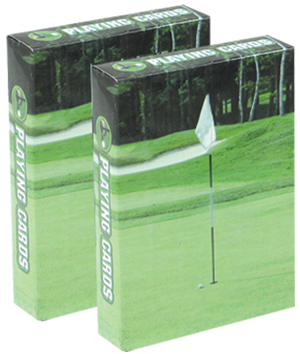 Golf Playing Cards for your Perfect Cribbage Gift!